Patients with esophageal adenocarcinoma (EAC) who receive endoscopic therapy survive as long as patients treated by surgery, according to the November issue of Clinical Gastroenterology and Hepatology. Esophageal cancer is a highly fatal malignancy—approximate 19% of patients survive 5 years. The incidence of EAC, the most common form of esophageal cancer in Western countries, increased by 1.5% between 1998 and 2008. Surveillance has also increased, via endoscopy of patients with Barrett’s esophagus, leading to detection of more patients with early-stage adenocarcinoma. These patients were formerly treated only by esophagectomy, associated with up to 10% mortality and 56% morbidity. However, endoscopic therapies such as endoscopic resection and ablation have become an effective treatment option for early-stage EAC, although it is not clear if they have been widely adopted by physicians. Furthermore, it is not clear if endoscopy and surgery are equally effective in treating patients with high-grade dysplasia and intramucosal carcinoma. Population-based data on long-term outcomes of patients with EAC after endoscopic therapy and surgery are limited. Saowanee Ngamruengphong et al. analyzed the Surveillance Epidemiology and End Results database to determine esophageal cancer-specific survival and overall survival of patients with early EAC treated by endoscopic therapy or surgery. They found that survival after 5 years was higher in the surgery group than in the endoscopic therapy group (70% vs 58%, respectively). 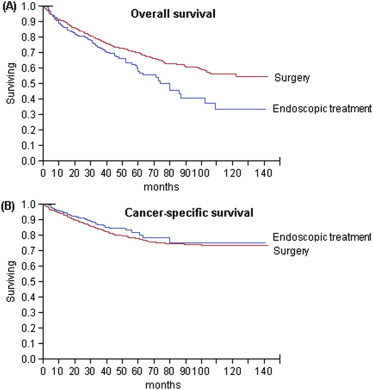 However, after adjusting for patient and tumor factors, patients treated by endoscopy had similar overall survival times and esophageal cancer-specific survival times (see below figure). Kaplan–Meier survival estimates for patients undergoing endoscopic therapy vs surgery . (A) Overall survival and (B) esophageal cancer–specific survival. The authors state that patients treated by endoscopy were likely to have been at high risk for surgery, which might account for lower unadjusted overall survival in the endocscopy group. Ngamruengphong et al. also found that the use of endoscopic therapy increased progressively from 3% in 1998 to 29% in 2009. Factors associated with use of endoscopic therapy included age older than 65 years, diagnosis in 2006−2009 vs 1998−2001, and the absence of submucosal invasion. Endoscopic and surgical therapies produced similar survival times among patients with tumor stages Tis/T1a and T1b, after adjusted multivariable regression analyses. Endoscopic therapy was incorporated into 2012 National Comprehensive Cancer Network guidelines for esophageal cancer. For a medically fit patient with localized disease, endoscopy is the primary treatment for Tis cancer and the preferred option for T1a cancer. Esophagectomy is the primary treatment for a T1b tumor. However, endoscopic therapy is recommended for medically unfit patients with Tis and superficial T1a or T1b cancer. The increased use of endoscopic therapy, compared with surgery, during the last decade indicates its increasing acceptance and availability; endoscopic therapy has spread from select academic centers to the general community. Ngamruengphong et al. expect its use to continue to expand.